The Smart Handpump was developed in 2011 by a team at Oxford University with a field-ready prototype starting operational trials in Kenya in 2012. These trials demonstrated proof-of-concept for remote monitoring of handpumps using simple microprocessor, accelerometer and global system for mobile communications (GSM) components. Smart Handpumps provide hourly data related to pump usage, providing information on functionality as well as insights into daily and seasonal water use patterns. In 2014, a preliminary analysis of the high frequency accelerometer data to show that the ‘noise’ generated by pumping also contains useful information. High-rate waveforms from the data can be processed using robust machine learning methods that are sensitive not only to the dynamics of the whole system but also the subtle interaction between the user and the pump. The small changes in pump dynamics and the subtle reactions of the user become a prominent signal in determining the deterioration of pump mechanics and imminent failure. This same signal can also be used to for shallow aquifer monitoring at the pump and user phenotyping. 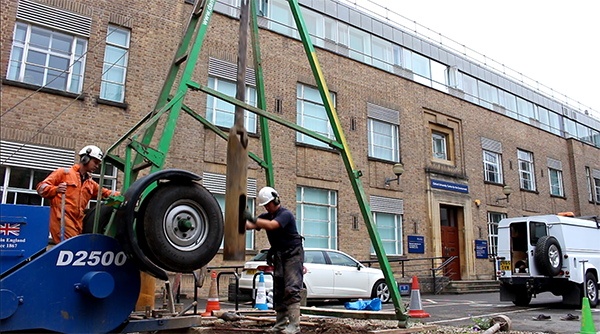 The borehole in Oxford is drilled to 7m and will have a Samrat handpump installed. This suction pump is commonly used at shallow wells in Bangladesh. The different dynamics of this pump, compared to current studies on deep well Afridev pumps in Kenya, will enable researchers to build a more robust predictive algorithm that is able to distinguish across multiple pump types, user characteristics, and aquifer variabilities. This project is a collaboration between Oxford University’s Engineering Department and Smith School of Enterprise and the Environment at the School of Geography and the Environment. In addition to UNICEF, the Smart Handpumps work is supported through the REACH programme and Gro for GooD – Groundwater Risk Management for Growth and Development, both major research initiatives funded by the UK Department for International Development and the UK Research Councils. This article originally appeared on the School of Geography and the Environment website.